Screwball Comedy is probably one of my favorite genres of classic Hollywood. Outpacing the film noir and the sappy love stories by a huge mile, screwball is where I get the most pleasure. The whirlwind pacing, the million pun jokes, and the physical comedy all make this genre such a freaking pleasure to sit through and re-watch. Claudette Colbert is easily one of the queens of the screwball genre and she earns her crown with Midnight. Colbert plays an English showgirl stranded in Paris with no money and only her wits and her fine dress to get her by. She befriends a taxi driver named Tibor Czerney. He drives her around town while she vainly tries to find some place she can earn money. As the night goes on, Czerney falls in love with her and tells her that she must stay in his apartment. But Eve (Colbert) has other plans. She gives Czerney the slip and enters a high society ball where she meets Helene Flammarion and her lover Jacques Picot playing cards. While they are in the middle of a game Helene’s husband walks in and interrupts their fun. As Mr. Flammarion observes the party, he is struck by how Picot is paying more attention to Eve than to his lover, Helene. Mr. Flammarion takes Eve aside and commissions her to win over Picot’s heart so that he does not have to divorce his wife. Everything goes well until Tibor comes looking for Eve only to discover that she is using his fake name. Screwball insanity ensues. Screwball thrives on love triangles. This movie has love triangles in spades. Not only is there the main one between Picot, Eve and Tibor, but there is Eve, Picot and Helene; Picot, Helene and Mr. Flammarion (played brilliantly by John Barrymore) and… well that is it, but still the various love triangles keep the film going and the plot driving. 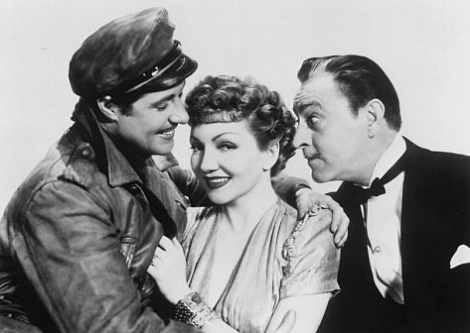 Colbert, Barrymore, and Ameche (Tibor) keep good pace with the shennangans and get all of the great one liners. Meanwhile the two actors playing Helene and Picot are mere stand ins and don’t ever really understand who they are and what they are doing there. This makes little difference because they are rarely on-screen without Colbert and one can’t help but be drawn to that long, lean figure of hers absolutely dazzling in those great dresses. What fascinates me about Colbert is how elegant she manages to look even while she debases herself in the name of comedy. She is wonderful in every aspect and really shines in this role. It is too bad that she insisted on doing any dramatic roles at all because she should never be too far from a prat fall.